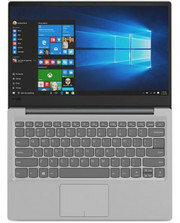 Model: The Lenovo Ideapad 320S-14IKB-80X400HMSP is a laptop equipped with budget components packed in a non-budget shell. 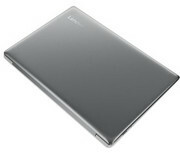 It is one of the most economical 14-inch models of the non-convertible ultraportable range of the Asian manufacturer. Everything but the aluminum lid is made of plastic, so it'll all-too-easily pick up dirty marks, and there's a certain amount of flex in both the base and the screen, so users will want to put it in a proper padded case rather than just tossing it in a backpack. Available in three different finishes, including golden and white, the laptop features silver-gray surfaces in both the work area, which has an elegant brushed pattern and in the base or cover which are smooth in the touch. The frame of the screen and its island keyboard is in black. It is a relatively thin model, with a thickness of fewer than 2 centimeters. 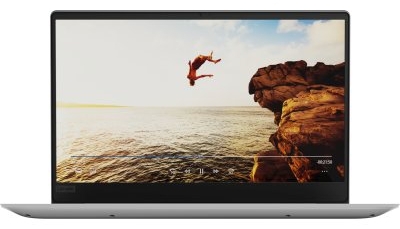 To achieve this small size, Lenovo has reduced the side frames of the screen to the minimum. However, it has not prevented placing a webcam with HD resolution in the upper frame of the screen, unlike what happens in certain premium ultraportables. Its hinged system, which allows an opening angle close to 180 degrees, keeps the screen in the selected position in almost any situation. 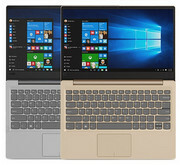 With a performance equivalent to the popular Intel Core i3-6006U, its low-power Intel Pentium 4415U microprocessor at 2.3 GHz, which has two cores and four process threads, will allow users to perform daily basic tasks and advanced tasks such as photo editing. Paired with the processor is 4 GB of DDR4 RAM at 2.133 MHz (a single module) and a 128 GB SSD with an M.2 interface. The low-end IdeaPad 320s-14IKB's biggest sacrifice is its screen. This is the most bog-standard 1,366 x 768 TN panel users are likely to find in other budget laptops. It takes some angling before a user will find a position that doesn't wash out or even invert some of the colors. However, the anti-glare coating on the screen really does neuter reflections, making this the ideal sub-HD media machine if a user can tilt the screen just right. As for networking capabilities, it is compatible with Wifi-AC and Bluetooth 4.1. While on the right side of the laptop, there is the Kensington lock, a USB 2.0 port and the SD / MMC card reader, on the left there is the power connector, an HDMI output, a USB 3.0 type A port, a USB 3.0 type C port, and the combined headphone and microphone connector. Its efficient hardware configuration allows its integrated battery of 52 Wh to exceed 7 hours of real autonomy. While the demand for high-end, macbooks competing laptops has increased, there is still a strong market for the affordable machine. The Lenovo Ideapad 320S-14IKB-80X400HMSP is the perfect laptop for the casual user. Intel HD Graphics 610: Integrated GPU (GT1) with 12 EUs found on some low-end Kaby-Lake CPU models (15 W ULV series). Same performance as the old HD Graphics 510. Non demanding games should be playable with these graphics cards. » Further information can be found in our Comparison of Mobile Graphics Cards and the corresponding Benchmark List. 4415U: Kaby-Lake-based ULV dual-core processor for thin notebooks and ultrabooks. Compared to the Core i3-7100H, the 4415U is clocked slower (2.3 versus 3 GHz), offers less Level 3 cache and a slower GPU. Both a manufactured in the same 14nm process.» Further information can be found in our Comparison of Mobile Processsors.